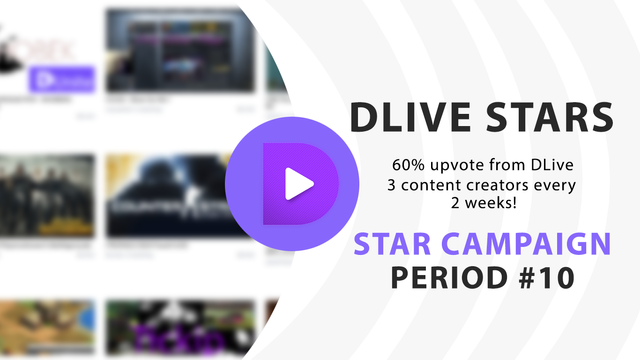 DLive Stars is a campaign where users are featured in the spotlight and titled with the renowned status of DLive Star. The winners are rewarded with a 60% upvote, but this isn't handed out to just anyone, becoming a DLive Star takes effort and commitment. These members of the DLive Community do everything they can, to produce high quality content and engage with their viewers. Check out the winners of DLive Stars Period #9 by clicking here, or the image below. Are you interested in becoming the next DLive Star? It's easy to participate, all you have to do is use the tag dlivestar, in your live streams and videos. No original, quality content is excluded. If you're a gamer, a vlogger, a foodie or anything in between, we welcome you to participate in this campaign. The 10th edition of DLive Star will run from June 11, 2018 to June 25, 2018. The winner will be announced shortly after June 25th. Visit the DLive Official Shop! This seems very interesting to follow to lift the reputation of steemit account as well as to earn an income .. I will try it and hope I can..
Nice to meet you too, I am Mr. Michael aka GRE3N. Welcome!! Let's Go brothers and sisters! Dlive is very amazing and always make dliver happy. Arriba Dlivestar!!! a llegado para quedarse, gracias por incentivar a los nuevos principiantes con esta maravillosa campaña, tiene una visión increíble, El poder ayudar a los demás a plasmar sus contenidos de una manera fantástica. un abrazo a todo el equipo @dlive por su gran iniciativa. Vienen grandes cosas con Dlivestar No te lo pierdas!!! Gonna register and stream live in memory of Pulse victims tonight :) Thanks Dlive ! Good luck to everyone!! I will be out there trying my best on stream! !